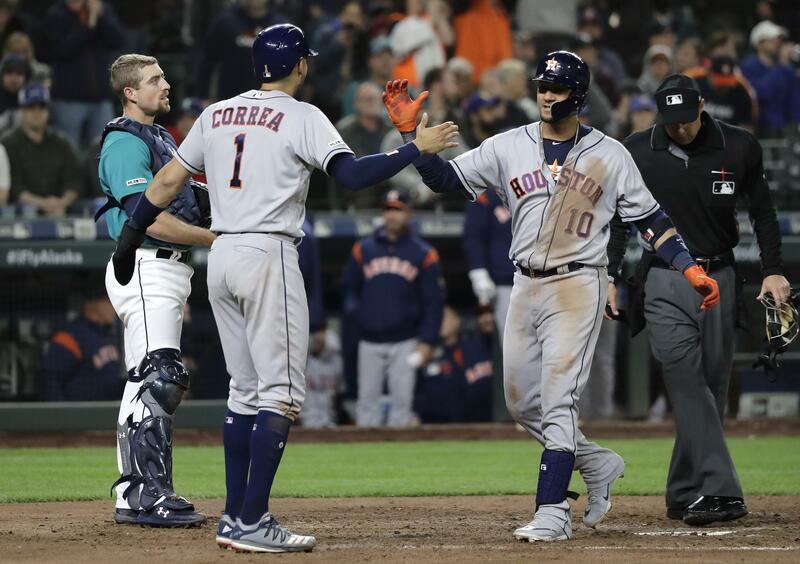 Fri., April 12, 2019, 10:44 p.m.
Jose Altuve and Yuli Gurriel hit grand slams as the Houston Astros defeated the host Mariners 10-6 Friday night, snapping Seattle’s six-game winning streak. It was the fourth consecutive game in which Altuve has gone deep, with five home runs over that span. George Springer also homered for the Astros, who rallied from a 3-0 deficit through two innings to extend their winning streak to seven games. Houston’s Brad Peacock (2-0) pitched 3 1/3 innings of one-hit relief, with seven strikeouts, to get the victory. RHP Shawn Armstrong returned from a rehabilitation assignment at Triple-A Tacoma after starting the season on the 10-day injured list with a left oblique strain and ended up allowing the grand slam to Altuve and took the loss. The M’s also recalled RHP Ruben Alaniz from the Rainiers and sent RHPs Matt Festa and Erik Swanson to Tacoma. … Astros 3B Alex Bregman, who has been out since injuring his right hamstring Tuesday against the New York Yankees, is “trending toward” a return Saturday, manager AJ Hinch told MLB.com. 16: Catcher Tom Murphy hit a solo homer in the ninth inning to extend the Mariners’ major-league record of consecutive games with a home run to start a season. Houston took a page out of the Mariners’ playbook, with all 10 of its runs scoring via the long ball – a pair of grand slams and a two-run shot. The move to call up right-handers Shawn Armstrong and R.J. Alaniz from Triple-A Tacoma backfired, with both giving up grand slams. The M’s continue their three-game series with the Astros as RHP Felix Hernandez (1-0, 4.26 ERA) is scheduled to face Astros RHP Justin Verlander (1-0, 4.24). Game time is 6:10 p.m. at T-Mobile Park. Published: April 12, 2019, 10:44 p.m.